Happy New Year everyone! It's quite different being in Turkey for the new year. They put up colored lights, trees, exchange gifts, all for their New Years celebration. Wayne put up two blog posts this week. The HOLIDAY BONUS one includes a thorough tour of the mostly empty inside of the boat where we try to imagine where everything will go. Included are drawings of the design, renderings, and screen shots of the 3D model. The video of the tour is over 20 minutes, but it shows how it's really beginning to feel like a boat to us. So I take it the Artnautica is a "borrowed" Dashew design? One thing I have always wondered about with this approach... the so-called great room is common living space and helm, but that seems directly counter to the boat's primary mission as a passage maker. To me, when running 24x7, you want a separate dark room for the helm so it can be dark without constraining other activities on the boat. With a common space, if someone wants a cup of coffee at night, they either have to make it in the dark, or spoil the helmsman's night vision. The more common power boat arrangement is to have a common helm/salon on coastal cruisers where 99% of operation is day time, and a separate pilot house on boats expected to operate with any regularity at night. This seems like a boat that is highly optimized for passage making (and done so at the expense of other operation) in all ways except the helm/salon, and those are optimized as one would for a day boat. I have always been puzzled by this. Twistedtree - As to your question about this design, I would ask is the original Nordhvn 46 a "borrowed" Beebe design? I would say not borrowed, but a next step. I think design is an evolutionary process. Sure, we liked the direction that the Dashew designs were going, but you would find ours very different if you looked more closely. We are more narrow and lighter than his designs, adhering more closely to the principles espoused in Voyaging Under Power - of LDL boats. We have less freeboard and far less weight aloft in the flybridge structure. The Dashew boats did the same thing the Nordhavns did. As they wanted to sell more boats, they had to make more room inside, and they moved away from the principles of long slender displacement vessels. Perhaps I can also explain why this "great room" design appeals to us. First of all, we come from many years of making long passages on sailboats. We have also done deliveries on powercats with windows all the way around and sailed motorsailers with inside helms. As such, we have been crossing oceans without a separate dark place for the helm, and we don't feel hampered by it. As a two-person boat, on passages, the other crew member is usually asleep when we're running at night, and with the galley set so far back from the forward windows, a dimmed light to make a cup of tea has no impact on the night vision of the helmsman. Also, we had certain design parameters and among these was the capability to be self-righting in the event of a broach. We're former sailors, so we're scared of the idea of doing without our deep keel. While high pilothouse boats have become the style as you point out, generally, they don't come back up if they roll over. Perhaps, rather than comparing these boats to day powerboats, a more apt comparison would be to cruising sailboats. John on the Attainable Adventures site refers to these boats as sailor's powerboats, and I think that fits. Could you expand a bit on these comments. I know it seems obvious but what is "self righting", why is it necessary for an ocean passagemaker and what are the design features that make it happen? And why aren't most high pilothouse boats self righting? I ask this because there have been a few recent posts from sailboaters who now want a trawler to cross oceans in and they don't seem to appreciate the design features that are required to make "self righting" (which would be essential for any trawler that I would cross an ocean on) possible. Hi Peter, really appreciate you taking time away from what is I'm sure a very busy schedule building your new N68 which I'm enjoying following on your blog as well. As per Christine's response I think there is the same kind of genetic or category similarity between our XPM78 Mobius and other boats such as the FPB's which have similar external esthetics being raw aluminium very slender LDL type passage makers. I think this is the same as in the much more prolific case of trawler style boats which to the unfamiliar eye "all look the same". As a pragmatic example if you do a Google Image search on "trawler yacht" you and I would see this vast range of distinctly different types of trawler style yachts from many different builders. But to those unfamiliar with these type of boats, it is easy to see how they do "all look the same". I am not aware of a name having emerged yet for our type of boat but if you type in "pilot boat yacht" you will see a similarly wide range of boats which have a lot of similarities and yet a lot of differences depending on how well acquainted you are with these types of boats. While the design we evolved with Dennis at Artnautica began with a very blank slate we also started with a very full SOR wherein we articulated all our first principles, priorities and use case. For those interested I wrote an early post detailing all of this on our Mobius.World blog. While voyaging under power is quite new to us, prior to our meeting six years ago Christine and I were both full time single handed sailors so we had very clear ideas and visions for what we wanted in our new boat and then spent over two years evolving this into a completed set of 3D models and build plans with Dennis. We certainly had a very large number boats and designers which influenced us and took full advantage of "standing on the shoulders of giants" as I referred to it in another post here. One of the largest was the ocean crossing work boats which we shared an anchorage with in the several years we spent in Majuro in the Marshall Islands. In particular we were aboard several of the brand new pilot boats and ocean tugs which stopped in to fuel up in Majuro as they were being delivered to their new owners both to the east and the west of us. Their influence on many of our external features and overall design esthetic is quite easy to see I think from that image search above on "pilot boat yachts". Throughout the entire design phase and now during building we continue to use our SoR and use case document to guide all our decisions and keep us focused on creating what we initially referred to as "Project Goldilocks" in reference to getting this boat "just right, just for us". This was very much the case as we were making our decisions between having the helm combined with the salon vs having the helm separate. We have done long passages on quite a few very different boats with different layouts and for us a kind of "hybrid" design was what evolved to be best for us. As you've seen and commented on, our "main helm" is part of our "SuperSalon" sharing an open single space with the Galley, Dining area and Lounge. As Christine noted earlier we have both covered a lot of nautical miles and a lot of ocean crossing passages spanning several weeks in many cases both single handed and now as a couple, so we had some very clear ideas as to what was "just right, just for us" in this regard as well. With just the two of us aboard 98% of the time and 100% on passages, our night time situation is different than most other boats I think and essentially the same as when we were single handed. When one of us is on night watch the other person is sleeping so there are rarely any lights on during the night when we are on passage. I appreciate that this is in stark contrast to most other boats that have larger crews and different preferences where there are multiple people near or around the helm and where a well separated helm would be preferred. However with our use case and the negatively raked glass, no equipment or anything else above the bottom window sills and carefully situated dimmable LED lighting, we think that our open style main helm area will work very well for us. And please don't take any of this to be dismissing the value of maintaining good night vision as we know that value very well and we have put a great deal of thought into the many ways of ensuring we can maintain excellent night vision in both helm areas and whether we are by ourselves or both there at the same time. In the very good example you sight of someone wanting to fix something to eat or drink late at night for example, one thing we are doing is surrounding the countertops in the Galley with short above counter lockers which have dimmable indirect lighting around their bases. In addition to dramatically reducing any light that might get up to the helm area this also provides good night lighting when we are on night watch and want to fix up something in the Galley. However as I mentioned earlier, we have also created a bit of a hybrid model by having a second helm station up top in our SkyBridge and that will be my preferred spot when I'm on night watch on long passages. Not so much for night vision concerns as I find our lower helm setup to work very well at night, but for the greater visibility this higher vantage point provides as well as greater situational awareness from its more open design. Your sharp eye will have also noted the untraditional aft location of the helm chair in the SkyBridge which puts it right on the pitch centerline for even greater comfort at sea. We were very careful to design this such that our eye level when seated in this helm chair provides great sightlines all around and for example I can see the first 2.5m/8' of the bow when in the helm chair. We are keeping this SkyBridge minimally enclosed to keep weight as low as possible but keep the wind and rain out so there is no HVAC up there and the sides are simple sliding acrylic. So this won't be the place to be on really cold night passages in higher latitudes but otherwise I think this upper helm will be my preferred location when I'm on night watch. I think that "best design" is always an incomplete statement lacking the relative context of "best design for me/us" and a given use case so please don't misconstrue my comments here as trying to talk you or anyone else into going this route. I appreciated your question and wanted to explain our logic in evolving our designs and making our decisions. For our use case and preferences this is the Goldilocks "just right, just for us" design and we think it gives us the choice of an isolated helm area and a combined helm/salon. Thanks again for your interest and thoughtful questions in our new boat Peter and we look forward to continuing to follow and learn from you as you build your new Tanglewood. Hi and Happy New Year David, thanks for your interest in the new boat we are building and our insistence that it be self righting. I think you answered your own question quite well in your last statement as like you we can't imagine crossing oceans on a boat that does not have this ability. Our use of the term self-righting is also the same as what you have in mind and what we know from our many years traveling the world on sailboats which is that in the event of being capsized or rolled the boat will return on its own to being right side up. About five years ago Christine and I were the very people you noted; "sailboaters who now want a trawler to cross oceans in", but we also wanted to continue to cross oceans with maximum safety and comfort. If you are interested I wrote up a full explanation of our design principles, priorities and use case in this post on our Mobius.World blog. Our previous sailboats, all monohulls were self righting by virtue of their deep keels with large lead ballast on the bottom of them which is largely to counter the forces from the sails at the other end but also adds a huge self righting lever arm. We were unwilling to give up this self righting feature if we moved to voyaging under power so we worked with our designer Dennis to design in other ways to make our new boat self righting. I can only give you my layperson understanding of what design features are required to make a boat self righting and will leave a more proper explanation to the expert naval architects and designers. I think it pretty much all comes down to physics and boat design such that at any point of heel or when the boat is at any angle to the water line the physical forces between the boat and the water will force the hull to return right side up. While there is a very complex relationship between them all, as I understand it the key elements to a self righting boat are; ability to maintain buoyancy, centre of gravity and shape of the boat. I find it helpful to think of it as a boat design that is purposely “unstable” in any position other than upright. And it would be important to highlight that we need to be vigilant AFTER the boat has been designed and built to not counter a good self righting design with alterations, additions, equipment and gear locations. •	Keeping all structure above the WL as low as possible; freeboard, above deck superstructure, etc. 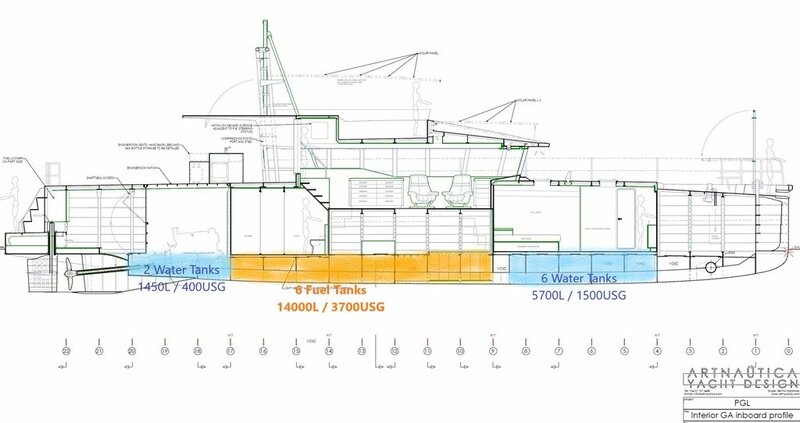 •	All fuel/water tanks integral to the hull and below the WL. With 14 individual tanks totaling 14,500L of fuel and 7100L of water this alone creates a huge self righting ballast force. •	Carefully tracking the weights and positions onboard of everything that makes up the boat from the raw materials of aluminium, wood, plastic, etc. as well as each piece of equipment and all our personal gear such that we can have a highly accurate model of the boat on which to run tests that include testing for self righting. This is how we answered the same questions you are asking David and hope it helps you and others who might be considering crossing oceans under power rather than sail. Wayne, thanks for the great replies. I'm a firm believer that there are lots of right answers in boating, so please don't take offense to any of my comments. Like you and many boaters, I'm always really interested in seeing the different ways people approach boating, and in particular boats capable of passage making. - Able to routinely and safely cross oceans, and all that implies in terms of stability, rugged build, redundancy, range, day/night operation, etc. - Be your home, either full time, or a significant portion of your time. Arguably Nordhavn is the only production boat that fits this in the 60' and below size. Krogens have done it, but it's a celebrated accomplishment, not a routine day. A fee diesel ducks, and a number of one-off boats. When you get over 60' the options start to open up, and above 70-80' there are plenty of boats of crossing-capable boats, but greatly in need of crew. The FPB-style boats fit in here as well, tough in smaller numbers and at the higher end of the length range. But with a very similar mission, comparing with Nordhavn is interesting, if nothing else. Both have their origins or inspiration with Beebe, but I see Nordhavn as 30 years of evolution of the idea of small power boats crossing oceans. The first design (the 46) resembles a sailboat much more than current models. And many Nordhavn owners are former sailors, myself included. We joke that the tag line should be "Nordhavn, ruining sailors one couple at a time". Some sailors spend some time on that big stinkpot, and never turn back. A friend had a sailing couple join him for a crossing from Cape Verde to West Palm Beach (3200nm) and I asked him how they liked the trip. His response was "ruined". Anyway, the 46 has evolved into today's designs which are more comfortable and accommodating without compromising the ocean crossing capabilities. The obvious advantage of your boat's shape is that it's fast, and if Nordhavns are anything, it's not fast. I remember seeing a movie once where the getaway boat was a Nordhavn. I thought that was hysterical. But this comes down to what you want to optimized for. To me, your boat and the FPBs are optimized for crossings, and comfortable and capable for day to day living. At least that's the impression I get from your walk through, and was our takeaway from spending time on Cochise. In contrast, Nordhavns are optimized for day to day living, and comfortable and capable of crossings. I'm sure your boat will be a good fit for you. You have certainly given it a lot of thought, and in my experience that's how you get the best results for you. The other balance was obviously a better fit for us. Of the people I know traveling the world, they still spend less than 5% of their time on crossings, so the Nordhavn optimization is a better fit for us. And their crossing capability is well proven at this point by over 600 boats, countless crossings, and no boats lost at sea. BTW, I love the CNC cut aluminum arriving as a "kit" that gets welded together at the yard. That seems a great way to build boats. And speaking of the Aluminum structure, are you planning any sort of insulation for sound attenuation and/or heat insulation? And, and I'll be real interested to see how your engine enclosure works out long term. Most sailboats have an angle of vanishing stability of 120 to 145 degrees. That means if you push the boat over to less than 120 degrees (that means the mast will be well underwater) then it will pop back upright when released. On the other hand when inverted these boats also have an angle of vanishing stability of maybe 30 degrees. That means if inverted and released IN CALM WATERS, the boat will float inverted indefinitely. But in practice this never happens. The big wave that pushed the boat over from upright will soon be followed by another big wave that will push it back. There are very few "self righting" boats. Some USCG vessels are close. So what happens when you do the same thing with a coastal trawler with only 70-80 degrees of positive stability? When they get inverted, as a result of the large volume in their superstructure, they have a big righting force that will return the boat, but often they just lay on the water in horizontal position. It has to get less to than 70-80 degrees from vertical to pop up so it just lays there on its side. This was emphasized in a recent video of a new trawler that capsized during launching. It just floated on its side. And all of the above doesn't consider window and scantling strength and downflooding vents which will also quickly scuttle a coastal trawler if it gets pushed over that far in heavy seas. So my definition of a passagemaker is a boat with an angle of vanishing stability of at least 100 degrees, preferably more. And with adequate scantling, window and downflooding considerations. I think it takes 100 degrees to meet CE A criteria. Can’t really tell from the drawings but she looks to be quite shallow draft and consequently the prop tip and rudder might be prone to cavitation in certain conditions. iirc correctly the Dashew boats went with twin engines and rudders because of this. I have always assumed that a boat the meets CE A is an acceptable criteria for ocean crossing. But I'm no expert on the matter, so perhaps put more faith in the criteria than I should? I hope not. In the accounts I have read of boats getting into trouble, down flooding seems to be the biggest risk. Power boats need ventilation, and no matter where you locate the duct openings, they are all at sea level when you are on your side.